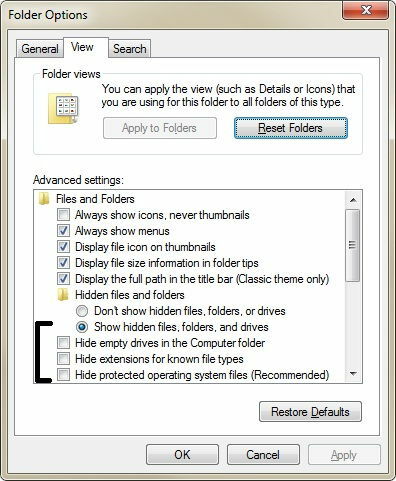 There are two ways to get to Folder Options and show hidden files and folders, press the windows start button -> Control Panel, arrange the view by large icons and find the folder options icon. Or from any open folder you go to tools -> folder options. To get to the folder options from any open folder you have to enable to menu toolbar. 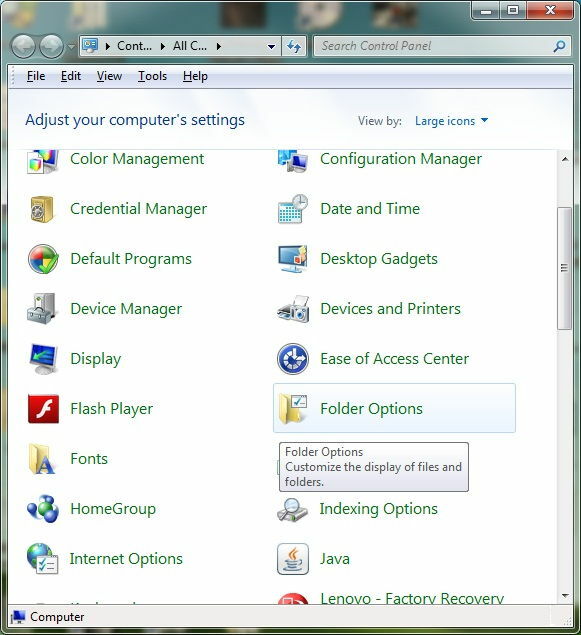 Open any folder (Windows Start Button -> Documents or Windows Start Button – Computer) and on the top left click the organize button hover over the pop up menu to the Layout Section and click on the “Menu Bar“. After you have enabled the menu bar you can go to tools and folder options. Now after you have opened the Folder Options you want to show hidden files and folders. In the image below you can see which radio buttons and check-marks you have to disable and check off. Select Show hidden files, folders, and drives. In this manner you are able to view hidden files. 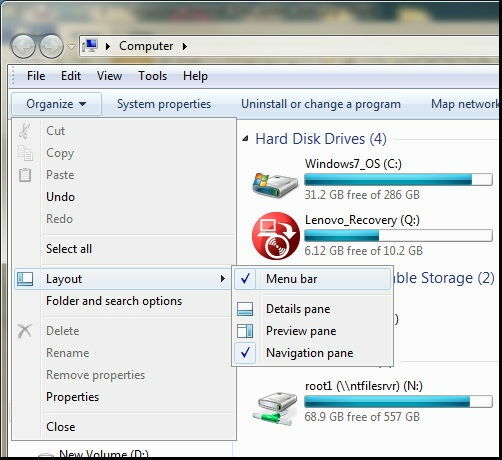 Check off the first check mark underneath, it helps you to view empty hard drives, when you browse the computer from the windows start menu. The following check mark is one of the most important. Hide extensions for known file types. When this is enable you won’t be able to view or alter the extension of known file types. All computer data is stored within files. All computer files have a name structure composed of two parts:”file.txt” File preiod txt. So the file name is composed from the file name and the extension divided by a period. The file name can be anything you want, however the extension has to be specific. This way the Operating System knows how to associate an icon to it and more importantly an application which knows how to open and interpret the file. So for example you can change the file.txt to file.ini or file.vbs. All the prior mentioned files can be edited with Notepad. But when they have the *.vbs and *.ini extensions, they become more powerful because the vbs and ini extensions can be also executed and send instructions to the Operating System. The same way you can have a file.pdf and a file.doc but these are just documents but notice the extensions. The pdf file will be opened with adobe acrobat reader, or a pdf vewer and the doc file will be opened with Microsoft Word or any document compatible application. Sometimes you need to be able to edit the extension of the file therefore check off the hide extension for known file types check mark. You can also check off the hide OS files to be able to view all hidden files contained in certain system folders. In this manner you can view hidden files and this is helpful when a fake anti virus attacks and hides all your files or when you need to access the hidden files and folders.